I had my first experience with brunch just a few years ago. I know, I know, I can’t believe that it took me this long to get into the whole brunch scene, but it did. I mean of course I’d had breakfast around 10 am before because that’s normally the earliest point in the day that I start thinking about food, but I had never really had “brunch”. You know what I mean, brunch, with the croissants, fancy butters, jams, mimosas, wine, fruit, etc. It all seemed so fancy to me and I was quite content with my bowl of cereal or granola bar. Well, that was up until a few years ago when I really experienced brunch for the first time when we were down in Florida. Let me tell you, all it took was one morning of brunch by the water and I was hooked. It just so happens that over brunch the other weekend, a friend and I were talking about my cooking and crafts; I sure do miss it! I don’t get to craft as much as I used to and I thought that I should probably get back into that! You know what’s better than crafting for myself? Making crafts and gifts for people I love! 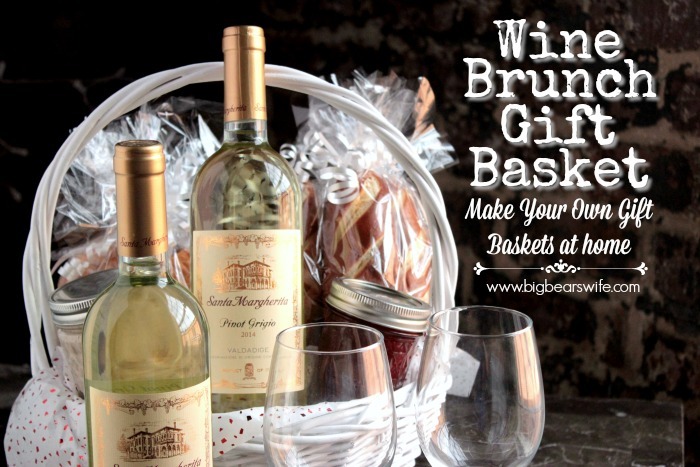 With that being said, I thought that I’d combine my love of brunch and my need to spoil those special people in my life into one fun gift idea with a Santa Margherita USA Wine Brunch Gift Basket! I know a few wonderful friends that would be just thrilled with this gift basket. 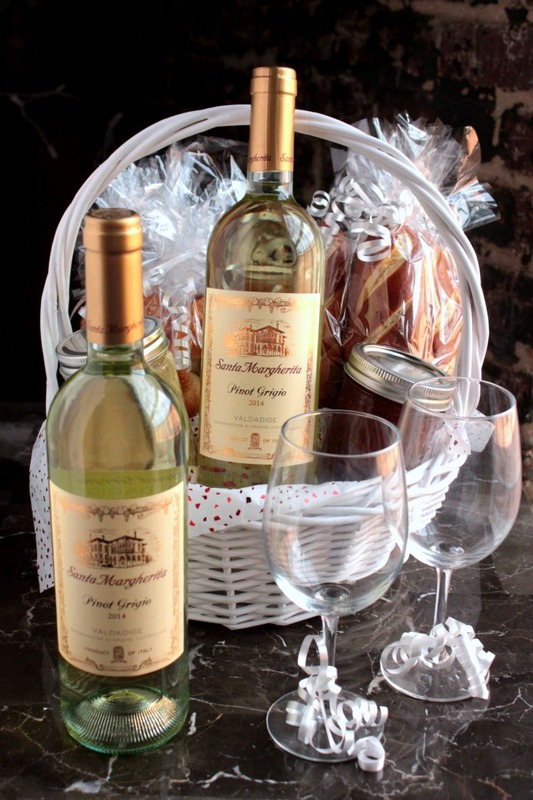 So what do you put into a Wine Brunch Gift Basket? I’m so glad that you asked! 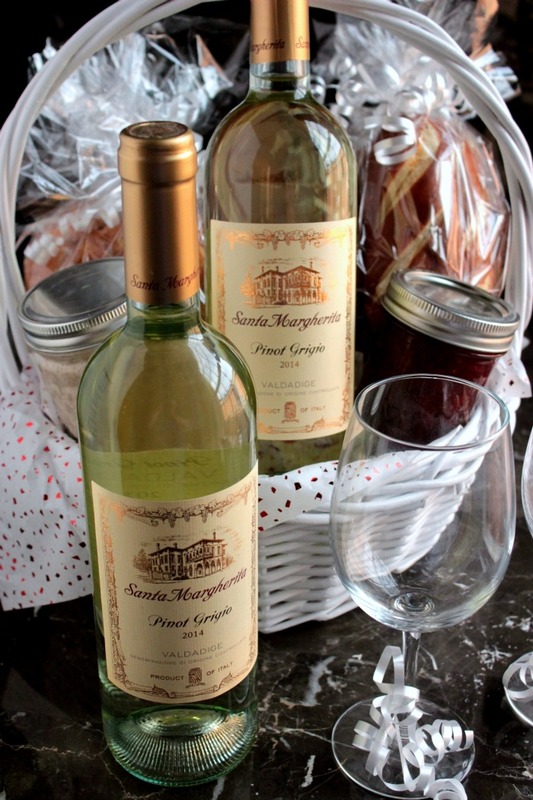 The one that I made to share with you today is packed with homemade strawberry jam and fresh croissants, a jar a homemade honey cinnamon butter and pretzel rolls, a pair of brand new wine glasses and a gorgeous bottle of Santa Margherita’s Pinot Grigio. Of course you don’t have to make this a brunch themed gift basket but who wouldn’t want to receive this one Saturday morning to start their weekend?! Snacking on a strawberry jam croissant while sipping a glass of Santa Margherita’s Pinot Grigio is exactly how I want to start my morning! 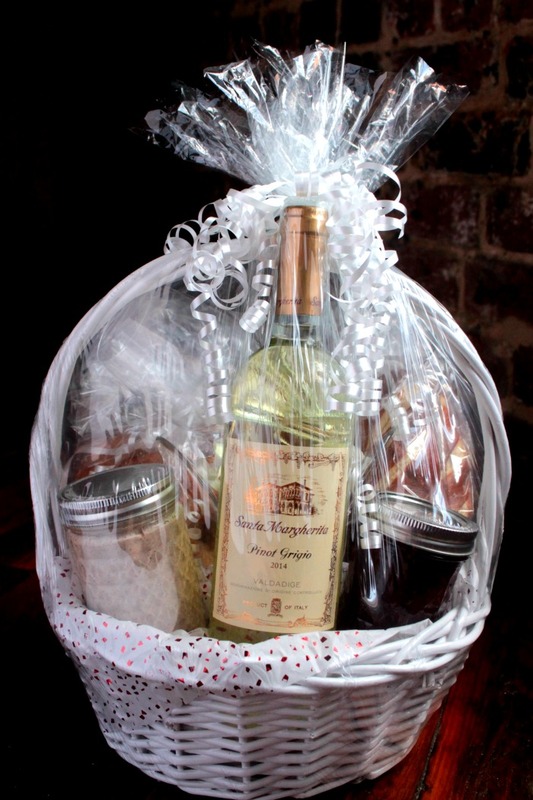 Pinot Grigio is a dry white white and the strawberry jam that’s packed into the gift basket is the perfect sweet touch to go with it! 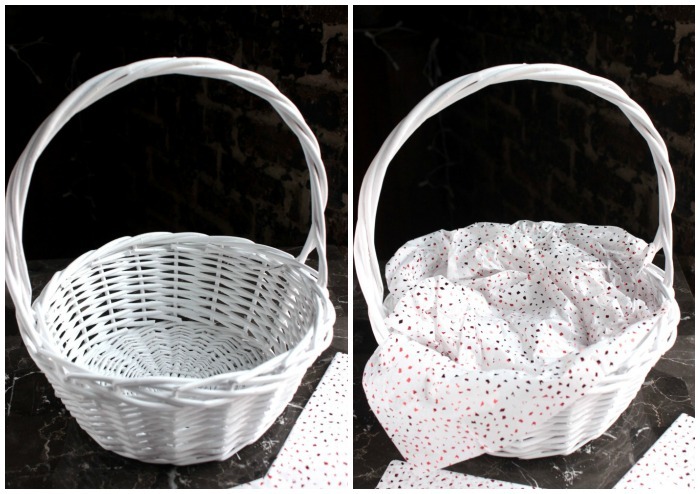 Fill the basket with the decorative tissue paper. Then set all of your items down into the basket. Tie a few curly ribbons around the wine glass stems and place the wine and the wine glasses together towards the middle of the basket. Wrap the entire basket in the plastic and tie at the top with the white curly ribbon. Tie the ribbon into a bow and curl the ends. I picked up a few bottles of Santa Margherita’s Pinot Grigio while I was out the other day and now I feel like I need to go out and grab a few more. 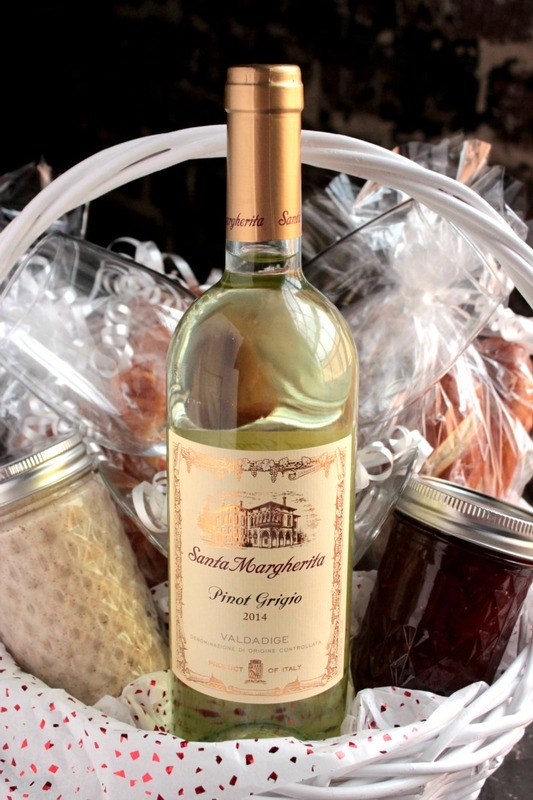 I’m so in love with this Santa Margherita’s Pinot Grigio and this gift basket; I want to make a few more for my friends and family! Have you had the chance to try Santa Margherita’s wines? Santa Margherita is one of the leading premium wine brands and their Pinot Grigio was first introduced in the U.S. back in 1979! I’m currently loving their Pinot Grigio but their bottles of Chianti Classico Riserva and Prosecco are high on my must try list! What would you fill your gift basket with? Check out Santa Margherita USA online – @SMWinesUSA & @SantaMargheritaUSA – for more idea and recipes. My husband and I (mostly him) are HUGE on brunch!! It’s kind of the new popular “thing” here where we live. I love this idea for a gift basket! How fun! 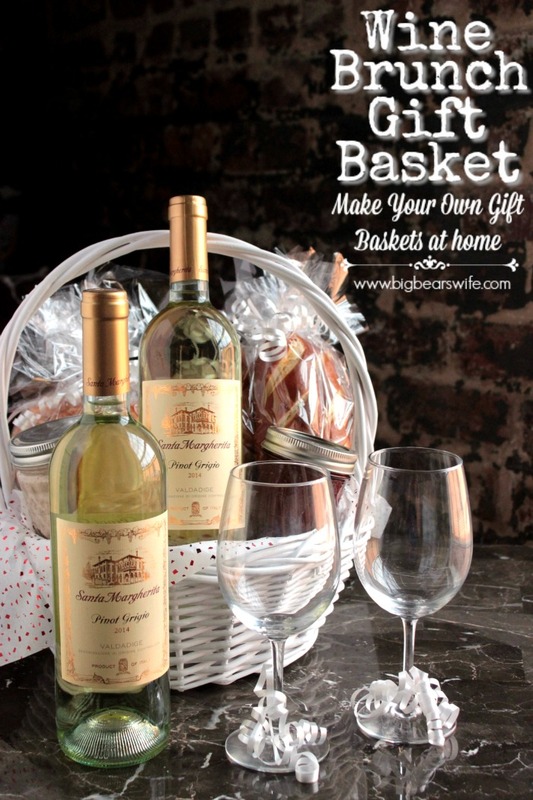 I have never made a gift basket, and I know my friends would love a wine basket!! Oh, how I love brunch. It’s my favorite. 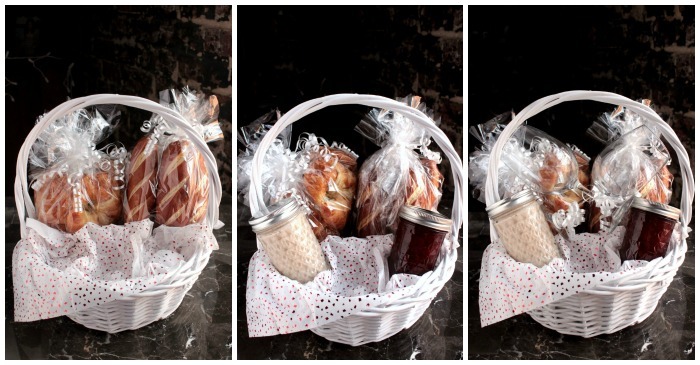 And this gift basket is such a grand idea — I love that you include strawberry jam with the croissants. That’s a great combination! This is my kind of gift basket! I love Santa Margarita too. Who wouldn’t love this basket? What a great idea. I would love one of these! Santa Margherita is my FAVORITE Pinto Grigio! It is SOOOO good! I’m not much for mornings, so brunch is my favorite meal. I love everything about this goofy basket. Wine makes brunch even better. I definitely need that cinnamon honey butter in my life. I love everything about this gift basket — especially the jam and crosissants! I might have to use this for an upcoming birthday present for my mom!! Awesome! I love the step-by-step photos. Such an elegant gift! This is my kind of basket! Love this wine! What a fantastic idea! I want a wine basket! Oh my, I love brunch and I love gift baskets. Plus wine, hello, I’m in. Sounds like I need to check out Santa Margherita’s wines asap. I think I’ll start with Prosecco first, I’ve got a recipe I need some for. I wonder if they carry this brand in Canada. What a great idea for a gift basket. So many great ideas to add to it, and I can think of tons of reasons to give it to someone! I am a huge wine fan, but haven’t tried Santa Margheritas yet, will look for it next time I am at the store. Ooooo, I’m so glad you finally discovered brunch! It’s one of my favorite ways to eat out! But that could be just because it’s a legit way to be drinking before noon, lol! This gift basket is perfect!! If someone brought me a basket like this I would be crazy happy! Not only do I love the wine but I love all the fun snacking options – hello honey cinnamon butter!